All children would benefit from God's anti-selfishness program. He calls it honor and it starts in the home. But many parents don't realize how powerful this one concept is. Honor helps a child deal with anger, meanness, and disrespect. It builds cooperation, contribution, and reduces tension in relationships. Honor helps the child with ADHD or Oppositional Defiant Disorder. Honor is God's idea but how do you develop it? Dr. Scott Turansky and Joanne Miller, RN, BSN teach this lively, practical, and relevant parenting seminar you won't want to miss. As you attend this seminar you'll receive practical, biblical advice for your parenting. All children are unique and new ideas will help you tailor solutions to meet the needs of your family. You'll leave with plans you can put into practice right away. Using stories, humor and plenty of illustrations, Dr. Turansky and Mrs. Miller will help you touch the hearts of your kids. Strategies directed to the heart help kids make lasting changes, but often require that parents think differently about the way they work with their kids. Parents have to change the way they parent before kids will change the way they live. Honor is God's anti-selfishness curriculum and he designed that it is to be learned in the home. Sometimes parents simply think of honor as manners or respect, but it's much more than that. Honor shows value to others and actually teaches kids to see what needs to be done and do it without being asked. 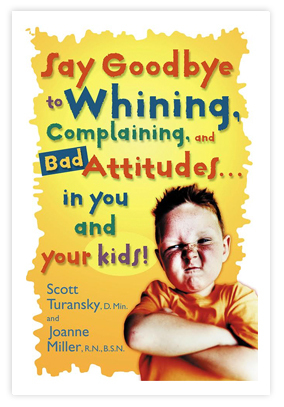 The material for this seminar comes from the book, Say Goodbye to Whining, Complaining, and Bad Attitudes, in You and Your Kids. It's a practical book about how honor changes people and addresses all forms of selfishness. The family is made up of imperfect people and selfishness often gets in the way of harmony in a home. For every form of selfishness in a family there's an honor-based solution. Obedience gets the job done but honor deals with how the job is done. In fact, teaching honor to children makes obedience work better. Honor addresses the way people relate to each other in a family. This practical session equips parents to make necessary changes to increase harmony and strengthen relationships in family life. It's interesting to see how you can use honor to get many things done in family life. In fact, an understanding of honor opens up a whole new barrel of parenting tools to work with your kids. Question and answer times provide parents with opportunities to present real problems they're facing and hear suggestions. The seminar ends by talking about God's desire to touch the hearts of parents, not just their kids. Parents leave the seminar encouraged, armed with lots of practical strategies, and a new vision for touching the hearts of their children. REGISTER NOW for an Honor Seminar near you. If you're hosting this seminar, here are some tools and resources to equip you. If you'd like to host this seminar, call 609-771-8002 or email Tracy, our seminar coordinator.